Shamir Piccolo® is the most advanced soft, short corridor progressive lens on the market. Ideal for fashionably small frames, it is designed for eyeglass wearers who don't want to compromise on style and quality. Based on Shamir's advanced EyePoint Technology®, Shamir Piccolo has an exceptionally wide reading zone and far vision zone. While fashion trends create a demand for short corridor progressive lenses, there will always continue to be a need for stable and comfortable vision. Designing a progressive lens is a mathematical procedure that involves managing optical errors to create optimal fields of vision. The best PAL designs are those that manage all optical variables and excess cylinders to create a lens with adequate, clear fields of vision and are easy to wear. Therefore, when designing a short corridor lens, optical engineers must take into account all optical variables, while delivering a lens with a short corridor. 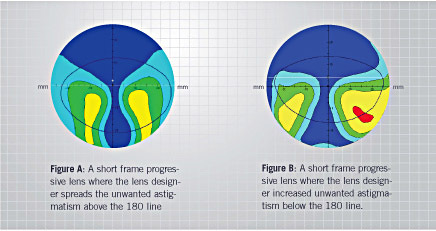 To provide a short corridor, the lens designer may choose to manage unwanted astigmatism across the lens by either spreading it over a larger area in the lens (figure A) or by increasing the density in limited areas (figure B).